Manda sivily mandala ny zon'olombelona nitarika ny hetsi-panoherana fandavàna visa tao amin'ny Tranoben'ny Fifindra-monina ao Wan Chai ny 6 Oktobra. Sary nalain'i Tom Grundy avy amin'ny HKFP. 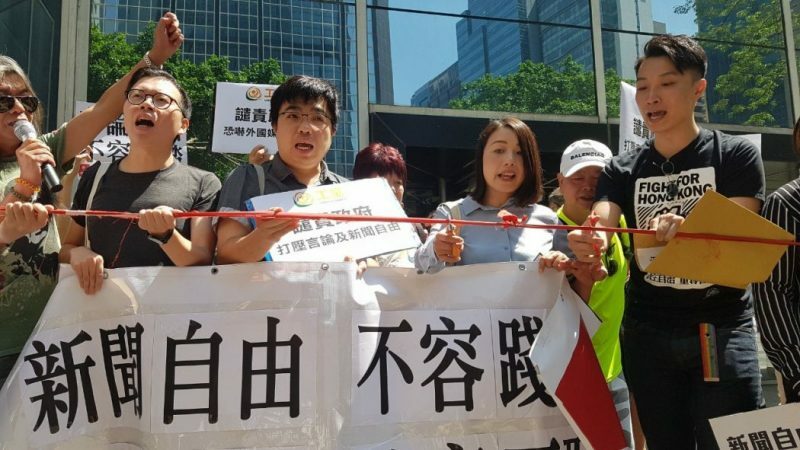 The Civil Human Rights Front led a protest against visa denial decision at the Immigration Tower in Wan Chai on October 6. Photo taken by Tom Grundy from HKFP. Ity lahatsoratra ity dia famintinana ny tatitra nivoaka tamin'ny 5-6 Oktobra 2018 tao amin'ny Hong Kong Free Press (HKFP). Mifototra amin'ny fifanaraham-piaraha-miasa ny famoahana azy indray. Nandà ny hanavao ny visa ho an'ny filoha lefitry ny klioban'ny gazety vahiny, Victor Mallet, sady tonian-dahatsoratry ny Financial Times ao Azia ihany koa i Hong Kong. Mpitondra tenin'ny Financial Times nilaza tamin'ny HKFP hoe. This is the first time we have encountered this situation in Hong Kong, and we have not been given a reason for the rejection. Ity no voalohany nahitanay toe-draharaha tahaka izao ao Hong Kong, ary tsy nomena anay ny anton'ny fandavàna. Hong Kong dia fari-pitantanana manokana ao Shina izay manana fahalalahana ara-toekarena sy manokana kokoa noho ny tanibe, natsangana araka ny foto-kevitra “Firenena Iray, Rafitra Roa.” Tato anatin'ny taona vitsy dia nanery an'i Hong Kong mba hankatoa lalàna vaovao manamafy ny ” Firenena Iray” ho ampahany amin'ny fitsipika i Beijing. Nitarika lahateny nataon'ilay mpikatroka mpanohana ny fahaleovan-tena, Andy Chan ao amin'ny FCC tamin'ny volana Aogositra i Mallet, izay noezahan'ny biraon'ny Ministeran'ny Raharaham-bahiny ao Hong Kong nosakanana. Lehibe mpanatanteraka teo aloha, Leung Chun-ying nampitaha ny hetsika amin'ny fanomezana sehatra ho an'ny mpampihorohoro . Nanome tsiny ny FCC izy noho ny fanitsahana ilay antsoina hoe “tsipika mena” ary nilaza fa maro no maniry ny hanazavan'ny klioba ny antony tsy namelan'ny governemanta ny hafa hiditra ao amin'ny toeran'izy ireo ao amin'ny Foibe. Natao ny hetsika taorian'ny filazan'ny polisy ny fandraràna ny Antoko Nasionaly Hong Kong izay noraràn'ny governemanta tamin'ny faran'ny volana lasa teo. The FCC is expecting a full explanation from the Hong Kong authorities for this extraordinary move, which is extremely rare, if not unprecedented. Ny FCC dia manantena fanazavana feno avy amin'ireo manampahefana ao Hong Kong amin'ity hetsika mahagaga ity, izay tsy fahita firy, raha mbola tsy nisy teo aloha. Mpitondratenin'ny New York Times, Eileen Murphy, nanipika fa “mampanahy mafy” ny fanaovana politika momba ny fizotry ny fizarana visa ao amin'ny faritra. We’re troubled that the government in Hong Kong may be preparing to expel a respected colleague at The Financial Times whose application for a routine visa renewal has been rejected without explanation, and we are seeking clarification from the authorities…Hong Kong’s commitment to freedom of speech and rule of law has long attracted international businesses and news organizations to the city, including The New York Times. Sahiran-tsaina izahay fa ny governemanta ao Hong Kong dia mety hiomana handroaka mpiara-miasa hajaina ao amin'ny Financial Times izay efa nolavina tsy misy fanazavana ny fangatahana fanavaozana visa mahazatra, ka mitady fanazavana avy amin'ny manampahefana izahay … nahasarika orinasa sy sampam-baovao iraisam-pirenena ho any an-tanàna ny fanoloran-tenan'i Hong Kong amin'ny fahalalaham-pitenenana sy ny fitsipi-dalàna, ao anatin'izany ny The New York Times. We have asked the Hong Kong Government for an urgent explanation. Hong Kong’s high degree of autonomy and its press freedoms are central to its way of life, and must be fully respected. Nanontany ny governemantan'i Hong Kong izahay mba hanome fanazavana maika. Ivon'ny fomba fiainany ny halehiben'ny fahaleovantenan'i Hong Kong sy ny fahalalahan'ny asa fanaovan-gazetiny, ka tokony hohajaina tanteraka. The rejection of a renewal of a work visa for Financial Times correspondent and Foreign Correspondent’s Club Vice President Victor Mallet is deeply troubling…This decision is especially disturbing because it mirrors problems faced by international journalists in the Mainland and appears inconsistent with the principles enshrined in the Basic Law. Tena manahiran-tsaina ny fandavana ny fanavaozana ny visa momba ny asa ho an'ny mpanao gazetin'ny Financial Times sady Filoha lefitry ny vahiny Klioban'ny mpitati-baovao, Victor Malettena … Manakorontana tokoa ity fanapahan-kevitra ity satria mampiseho ny olana atrehin'ny mpanao gazety iraisam-pirenena ao amin'ny tanibe ary hita tsy mifanaraka amin'ny fitsipika napetraka ao amin'ny Lalàna Fototra. Fikambanana tsy miankina ao an-toerana sy iraisam-pirenena maromaro no nanohitra ny fanapahan-kevitry ny governemanta. Ny Asabotsy 6 Oktobra, nanao fihetsiketsehana tao ivelan'ny Sampan-draharahan'ny fifindra-monina ny vondrona FTMF =ONG ao Hong Kong, Civic Human Right Front ho fanoherana ny fanapahan-kevitra tamin'ilay visa. The Hong Kong authorities’ visa renewal rejection—without explanation—of a journalist who’s done nothing more than his job smacks of Beijing-style persecution of critics… it indicates a quickening downward spiral for human rights in Hong Kong: that the Hong Kong government is now following Beijing’s leads in acting aggressively towards those whose views the authorities dislike. Ny fandavan'ny manampahefana Hong Kong hanavao visa ho an'ny mpanao gazety iray izay tsy nanao afa-tsy ny asany—tsy misy fanazavana— dia mampiseho fanenjehana ireo mpitsikera araka ny fanaon'i Beijing … mampiseho fitontogan'ny zon'olombelona ao Hong Kong izany: fa manaraka ny dian'i Beijing amin'ny fomba masiaka amin'ireo izay manana fomba fijery tsy tian'ny manampahefana ny governemantan'i Hong Kong. 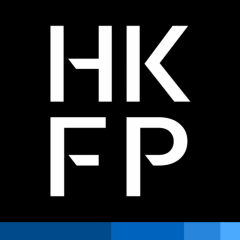 Freedom of speech and press freedom are the foundations of Hong Kong’s success. The denial of [Mallet’s] visa will further harm press freedom and freedom of speech, and it will severely harm Hong Kong’s status as an international city. Ny fahalalaham-pitenenana sy ny fahalalahan'ny asa fanaovan-gazety no fototry ny fahombiazan'i Hong Kong. Ny fandàvana ny visa an'i [Mallet's] dia hanimba kokoa ny fahalalahan'ny asa fanaovan-gazety sy ny fahalalahana miteny, ary hanimba tanteraka ny satan'i Hong Kong amin'ny tanàna iraisam-pirenena. This is clearly a form of retaliation for his involvement in the public talk organized in August by FCCHK, which angered Beijing by featuring a pro-Hong Kong independence activist. Such action is yet another proof that the Chinese authorities are extending their policy of intimidating foreign journalists to the territory of Hong Kong. Mazava ho azy fa endrika fanenjehana noho ny fandraisany anjara amin'ny lahateny ho an'ny daholobe nomanin'ny FCCHK tamin'ny volana Aogositra izany, izay nahatezitra an'i Beijing tamin'ny fanasongadinana ilay mpikatroka mpanohana ny fahaleovantenan'i Hong Kong. Ny hetsika toy izany dia porofo iray hafa fa manitatra ny politikan'ny fampitahorana ireo mpanao gazety avy any ivelany ao amin'ny faritanin'i Hong Kong ny manampahefana Shinoa. The Beijing authorities need to respond now more than ever to its decision to suppress press freedom in Hong Kong, as its state of human rights is being evaluated on by other Member States in the upcoming session, as is its duty as a member of the United Nations. Mila mandray fepetra dieny izao ny manampahefana ao Beijing manoloana ny fanapahan-keviny hanafoana ny fahalalahan'ny asa fanaovan-gazety ao Hong Kong, satria hodinihan'ireo firenena mpikambana hafa mandritra ny fivoriana ho avy ny toeran'ny zon'olombelona ao aminy, ary adidiny amin'ny maha-mpikambana azy ao amin'ny Firenena Mikambana izany.